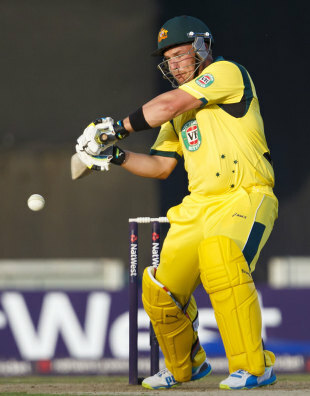 Aaron Finch is determined to build on his Twenty20 world-record knock of 156, which also included the most sixes in an innings, to ensure he secures a place at the top of the Australia's order for the long term rather than the sketchy relationship he has had with international cricket until now. Finch made his Twenty20 debut against England in January 2011 but the Ageas Bowl match was only his seventh cap and he admitted that he had not made the most of his previous opportunities. He acknowledged that this was "just one of those days" where everything went his way, but was relieved to have supported the selectors' decision after his appearances during the previous Australian season had brought scores of 1, 7 and 4. "I suppose being in and out of the side is never ideal. I felt like, last year, I let a couple of chances slip and it's always good to score runs and contribute to a win, especially in the first game of a new series," he said. "For my own confidence, and probably for the selectors' confidence in me, it's nice to get a good score and repay some of that faith." And while his immediate focus is on the second Twenty20 international at Chester-le-Street on Saturday, Finch is hopeful that his scintillating display will allow him to stay for the five one-day internationals which follow. There are currently 18 players in the squad, but when the party was named, John Inverarity said that it would be trimmed, possibly to 15, for the ODIs, which means three players could be on their way after the weekend. Initially, Finch would probably have been one of those expected to make way considering his seven ODIs have produced 105 runs at an average of 15 but the selectors may now find it difficult to put him straight back on a plane. "Hopefully I've staked a pretty good claim for the rest of the series and hopefully I can stay on," he said. Finch said he was unaware of how close he came another new record for the fastest Twenty20 hundred, as he caught up with Richard Levi's 45-ball mark. For a matter of deliveries he took his foot off the pedal as, even for someone who had dispatched England's attack to all corners, the looming landmark started to prey on his mind. "You could probably tell I started blocking the hell out of it around a hundred. I did get a little bit nervous but had no idea what the record was." Stuart Broad, the England captain, refused to be too harsh on his bowlers on a day where 457 runs were scored in 40 overs and instead praised Finch for "special" innings. "It was special striking from Finch, to hit 14 sixes in an innings. I think we can say we tried everything at him as well he just played everything fantastically well," Broad said. "In Twenty20 cricket that can happen. He made it his day in quite spectacular fashion, but I'm very proud of the guys who showed up in our side and fell just short of our highest international score. It would have been very easy to be 100 all out there and fallen down. The crowd would have gone unhappy. "There're certainly 11 disappointed English guys but the crowd have had a fantastic day with 460-off runs. We're disappointed we haven't won, but it was a cracking game of Twenty20 cricket."